The global liquid packaging market is prognosticated to have various players in it, both regional and international. Owing to this, the market seems to be highly fragmented and competitive for the new as well as existing players. The key players are concentrating on developing advanced products to improve their product portfolios with new innovations and R&D activities. This is estimated to contribute in the gwoth of global liquid packaging market in the coming years. The firms are getting into acquisitions and mergers, collaboration, and tie-ups to suatin their lead in the market. This is another significant factor behind market growth. The major players operating in the global liquid packaging market include BillerudKorsnäs AB, Comar LLC, Liqui-Box Corporation, Tetra Laval International S.A., and Evergreen Packaging Inc. A popular alcoholic beverage company Jim Beam in 2016, rebranded its packaging strategy for its several product range. This supported the firm to improve its market position and enhance the brand-image in liquid packaging market. 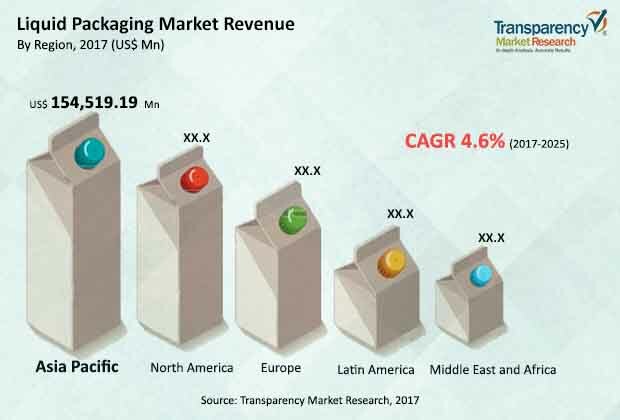 As per the recent report by Transparency Market Research (TMR), the global liquid packaging market is foreseen to expand at a decent CAGR within the forecast period from 2017 and 2025. Based on the packaging type, rigid packaging segment is domianting the global liquid packaging market. The segment accounts for the highest share of market in 2016 in terms of value. As per the geography, Asia Pacific region is likely to account for major share of the liquid packaging market and sustain its lead in the future years. The growth is attributed to the fast gwoth og food and beverage and pharmaceutical industries. Moreover, the supportive government norms and improved manufacturing services by the major players, due to the low manufacturing price and labor. The increased concentration of the major players on developments and advanced technologies is considered as one of the main factor anticipated to support the development of the global liquid packaging market in the following couple of years. The rising number of brands with interesting packaging is probably going to help the market development in the forthcoming years. Moreover, the rising focus on customization is evaluated to upgrade the development of the market and offer potential development scope for the market players in the coming couple of years. On the other side, the launch of a few substitutes, for example, the rising carbon impression and bio-based polymers and assessed to hamper the development of the overall market in the coming years. Nevertheless, the surging demand from a few developing countries and the affordability offered by liquid packaging are assessed to increase the growth of the global liquid packaging market in the upcoming years. Brand supervisors are coming across the restrictions in development of new items with varieties due to from significantly developing competitive scenario and consumer base. Packaging design is a key point behind the deals, as purchasers have inclination toward getting brand conscious. A couple of factors, for instance, necessity for innovative packaging plan with the true objective to pull in clients and the need to isolate things from others have ended up being a must for a term development of brand.